I am presently reading Your Body’s Many Cries for Water, by Dr. Freydoon Batmanghelidj (1931-2004), a book that was referred to me almost a year ago that I finally got around to. I’m really attempting to read about ten books at once, but this one and How We Heal by Douglas W. Morrison have the bulk of my reading attention right now. One day I’ll simply put a book to my head and all its information will simply transfer to my conscious awareness, but for now, reading remains a word-to-word process. And I’m very okay with that. Dr. Batmanghelidj’s book is zeroing in on what is likely the central, and most overlooked aspect of health status and healing. That is, our relationship to water, and more importantly, our perceptions about it. Water is absolutely central to human health. While oxygen is essential to sustaining life as we know it through respiration, water, which also contains oxygen, literally makes being “physical” possible. Please note the word respiration. Let’s break it down a bit more to “re-spire,” which could also be interpreted as “re-spirit.” Respiration could be seen as the process of receiving the energy (vitality) of spirit, over and over again. Only by that ongoing process can we be present in this world. 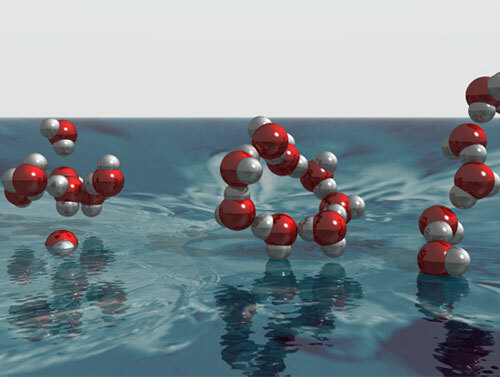 Water delivers oxygen to the cells, which in turns burns hydrogen and produces energy in the form of a chemical called adenosine triphosphate, or ATP. It’s also interesting to note that oxygen is taken into the body via respiration and hydration (H2O), but it is also transported out of the body as carbon dioxide (CO2). Without the flowing pliability and permeability of water, physical movement would be impossible. However, water does much, much more than simply act as a “spacer” and movement facilitator between the more “dense” particulates and molecules or microorganisms that make up and reside in the human body. When water is in adequate supply, and the process of oxygen delivery and waste elimination is functioning smoothly, we will be in good health. At the very least, we have an opportunity to be healthy, because health is the normal state for every human being. The fact that so many of us are unhealthy, and are “battling” with this or that disease condition is indicative that we’ve been overlooking something… something that perhaps seems just too simple and obvious to be true. The more I learn about water, the more the sad truth reveals itself in its full authenticity. I say “sad,” because even as you read this article, thousands of people are transitioning out of their life after “losing their fight” with some form of disease. They will have been probed, mutilated, drugged, and radiated to the point of surrender, due to our failure — or refusal — to recognize signs of dehydration as calls for water. It is becoming increasingly evident that the pain that we endure, as well as the exorbitant expense of traditional medical treatment, is wholly unnecessary. I refer not only to the expense of treatment, but of medical insurance. Since modalities that actually mitigate disease are generally not supported by traditional medicine, and not paid for by health insurance companies, not covered by mainstream media (except to stimulate doubt and fear), and not championed by the FDA along with its counterpart in Canada and other parts of the world, the public is left to fend for itself, to find articles like this that provide a different perspective. Dr. Batmanghelidj’s book has sold over a million copies. Yet, the understandings that he delivers are still generally unknown and have not been adopted in Standard Medical Practice. When a sick person walks into a hospital and his hydration status is monitored, mineral and microbial levels are ascertained, his pathogen load is measured, and the first priority response is to bring his body back into homeostasis, then I’ll know that real change has occurred. Currently, medical science is still in combat mode, where they want to declar war on a pathogenic or bacterial “enemy.” This “old school” approach isn’t working mainly because the patient’s hydration status is worsened by the treatment, and the body chemistry is taken further out of balance. Yet, until the patient understands this, and most of them do not, they will continue to agree to take the drugs, and have organs removed when the body could literally heal when its environment is “rebooted” and respiration and hydration pathways are reopened. Along with malnourishment, and over use of synthetic chemicals, pollution in the water has been a contributing factor to our current medical problems, as they increase the viscosity of the blood while reducing the pressure, as well as the electrical charge, that each cell carries. An over acidic environment will be oxygen deprived, which devitalizes the blood, causing cells to lose their negative charge and clump together as in the image below. This makes it harder for the blood to flow and serve its function. 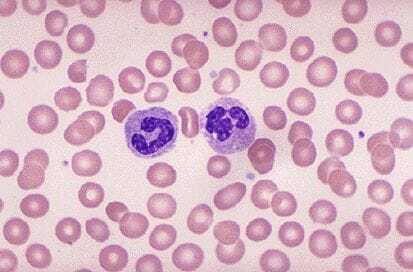 Healthy blood cells are spherical. The negative charge that they carry helps maintain balance and lower blood viscosity. The MMS protocol, that uses sodium chlorite and an activator to create and introduce chlorine dioxide in the body (see article, “No Miracle, Just Wonderful Chemistry“), has demonstrated itself to be an effective way to help reduce the pathogen and microbial overload that contribute to higher blood viscosity and dehydration when we have allowed our body chemistry to become out of balance. It is a step in the right direction that is yielding great results for a growing number of people, but still, the fundamental issue is our perceptions about, relationship to, and consumption of water. Dr. Batmanghelidj’s book is very helpful in this respect, as he points out that “dry mouth” is one of the last signs of dehydration, and that there are many more markers that indicate a simple need for water that we routinely ignore while responding to with other treatments that make matters worse. The human body can become dehydrated even when abundant water is readily available. Humans seem to lose their thirst sensation and the critical perception of needing water. (I can certainly attest to this for myself.–AA) Not recognizing their water need, they become gradually, increasingly, and chronically dehydrated as they age. Further confusion lies in the idea that when we’re thirsty, we can substitute tea, coffee, or alcohol-containing beverages. This is a common error. The adoption of the “view shift” (new paradigm) dictates that chronic pains of the body that cannot be easily explained as injury or infection should first and foremost be interpreted as signals of chronic water shortage in the area where pain is registered—a local thirst. Pain is a sensation in the area that denotes local chemical changes in the area around the nerves that monitor the acid/alkaline balance. The mechanism is designed to safeguard against a buildup of excess acid from metabolism that could “burn” and eat into the cell membranes and the inner structures of the cells in the area. When water is not available to wash the acidic toxic waste of metabolism, the nerve endings sense the change and report it to the brain’s pain centers. after some time getting nowhere doing the above, remove the organ altogether, all while the initial, underlying condition of dehydration continues. With all that said, not one of these approaches solves the original problem. And when we don’t question our methods, we are left to assume that the body simply falls into disrepair and dysfunction with age, which is not so. No one wants to drink tap water anymore, yet we shower and bathe in it, wash our dishes and clothes with it, and even fill the pots for soup and stew meals with it. Taking a shower or bath delivers far more chlorine to the system than several glasses of water each day. Many people, myself included, have naively assumed that beverages, such as soda pop, Gatorade, coffee, bottled water, “energy drinks,” and other beverages will satisfy their water intake needs. However, this is an assumption that has not served us, and has contributed to the major health problems that we now face. Alcoholic beverages are even worse. They can never be drank responsibly when you realize that they only bring more dehydration. Bottled water is not necessarily safe, as many of the popular brands sport pH levels in the range of 5 or 6. Here’s a thought: Every beverage sold should be required to display its pH on the label. pH may not be the only factor, but it’s too much of a major one to overlook. More fundamental to the water question itself is whether the water we’re taking in is “structured.” There are those who think the idea of “structured water” is ridiculous, so convinced that we know everything there is to know about everything, and if there hasn’t been enough accepted “scientific study” on the subject, then it can’t be. However, the research done by Dr. Musaru Emoto (The Hidden Messages in Water) on water has in fact, given us great clues to properties of water that have been far beyond modern science’s ability to quantify. Essentially, the water that arranged in beautiful crystal formations when quick frozen had the attributes of being structured. The consistent organizing coherency of the formations, which coincide with the consistent quality of intention behind the associated thoughts that determined whether the water structured or not, shows an intelligent — and I dare say divine — connection that we overlook. Our obsession with “killing germs” that we can see exposes our ignorance about that which we cannot. Water is not so myopic. It appears to respond to, and be affected by many things that we tend to dismiss, such as our thought patterns and beliefs. The healthier our thought patterns and beliefs, the more likely the water within us will be structured. However, that is also influenced by our beliefs about water and hydration, which, it seems we’ve not thought to be very important. As my “water consciousness” has I met a man recently who developed a device that structures water. A few months ago that might not have meant that much, but now it means quite a bit. Clayton Nolte’s device, referred to as a “bio-photon” water structuring unit, has no moving parts, requires neither electricity, nor magnets, but will change the water’s pH to 7.5, clear its memory (as the Earth would do to produce spring water), neutralize the chlorine and fluoride information that the water carries, and reduce the surface tension so as to make it available to each cell. It is available in configurations that fit under the sink, on a shower head, on a garden hose line, or at the entry point to the house, which would mean that the water that comes from all faucets, for all applications, is structured. There is much more to learn about this, and more to share, but this is a subject that warrants further study. Listen Here — My interview with Clayton Nolte on Talk for Food. Buy Here — Nature’s Hydration Bio-Photon water structuring devices, developed by Clayton.